MILWAUKEE — Baseball has an odd sense of timing. Two days after he was claimed off waivers from the San Diego Padres, Jordan Lyles joined his new team, the Milwaukee Brewers, Tuesday night as they opened a three-game series against the very same Padres. Lyles didn’t pitch Tuesday night but one of the youngsters called up when he and Ross were put on waivers did as Trey Wingenter worked a scoreless ninth inning in San Diego’s 11-5 victory. He’ll be followed Wednesday when Brett Kennedy gets his first career start as the Padres face the Brewers in the second game of the series at Miller Park. Kennedy, a 24-year-old right-hander, has dominated the Triple-A Pacific Coast League this season, going 10-0 with a 2.72 ERA and struck out 80 batters while holding them to a .233 average in 89 1/3 innings. Kennedy was San Diego’s 11th-round pick in the 2015 Draft and earned his first invitation to big league camp this past spring, after going 8-11 with a 3.70 mark for Double-A San Antonio this season. He opened the year with El Paso and now, with the Padres, building for the future, Kennedy is finally getting his chance. He joins a Padres team that’s riding a little bit of a hot streak after going through a miserable 5-20 July. The Padres split a four-game set with the National League Central-leading Cubs over the weekend at Wrigley Field and slugged three home runs Monday in the series opener against Milwaukee — the second-place team in the Central and current NL wild card leader. Along with Lyles, the Padres will see another familiar face in Brewers starter Jhoulys Chacin, who went 13-10 with a 3.89 ERA for San Diego last season then landed a two-year, $15.5 million deal with the Brewers in January. 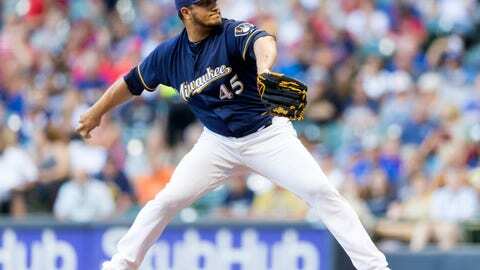 That signing has turned out to be one of the best deals of the winter as Chacin has gone 10-4 with a 3.89 ERA though 24 starts this season including a 4-2 mark and 3.46 ERA in nine starts at Miller Park. Chacin pitched a rare dud his last time out, allowing a season-high nine runs (eight earned) on five hits and four walks over 4 1/3 innings in a 25-7 loss at Dodger Stadium. Prior to that drubbing, Chacin was 4-0 with a 2.52 ERA in his previous six starts, allowing more than two runs once during that stretch. “I just couldn’t make pitches when I had to,” Chacín said after the Dodgers game. “You know, it could have gone a different way, especially the 3-2 to Grandal. I felt I made a good pitch to get him out, but it didn’t happen. But anyways, I couldn’t make a good pitch to the next guy to get at least an out. Chacin has faced the Padres once already this season. He took a no-decision after allowing four runs on seven hits and lasted 3 1/3 innings in his first start of the season March 30.